Scrobbles for Last.fm brings the music network Last.fm to your Mac! 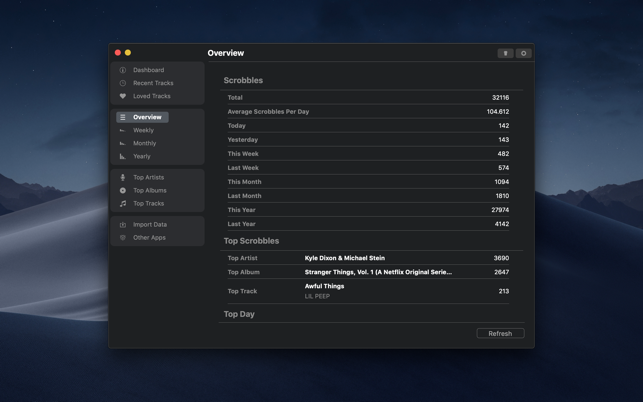 The app offers both Last.fm statistics and iTunes scrobbling. 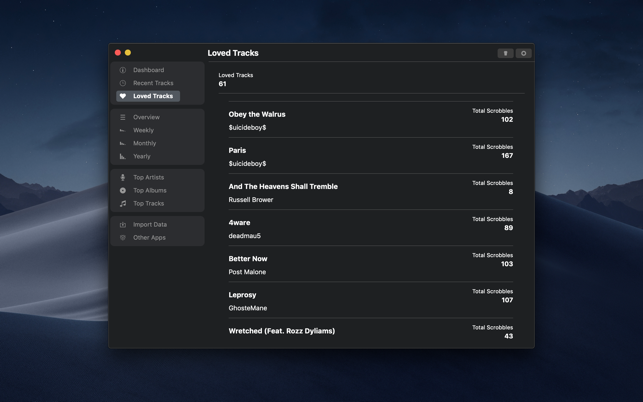 Scrobble your currently playing track to Last.fm. Tracks that were played in the past, are not scrobbled. 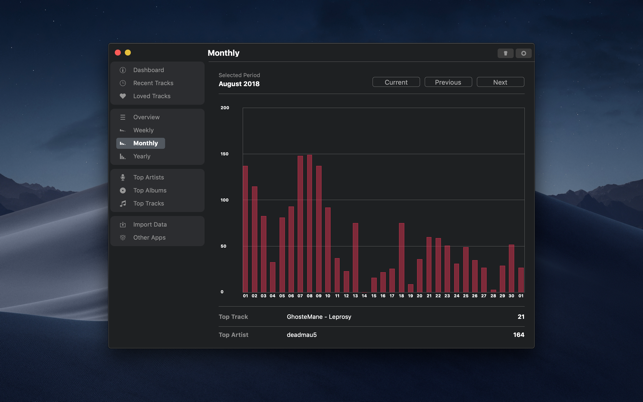 Scrobbles has to be active while the track is playing in iTunes in order to send the data to Last.fm. 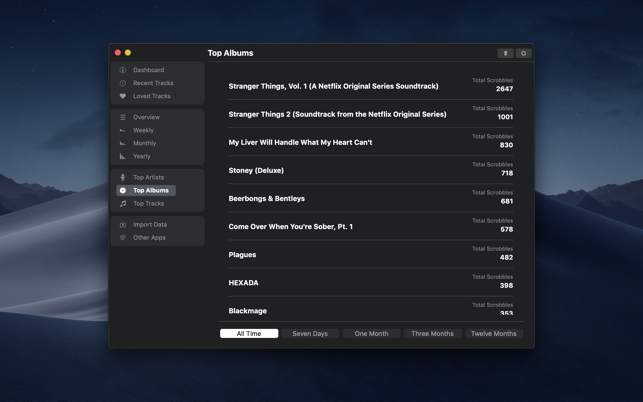 You can show the currently playing track and scrobbling statistics in the configurable menu bar extra! This feature can be disabled in the preferences (when disabled, only an icon is displayed in the menu bar). 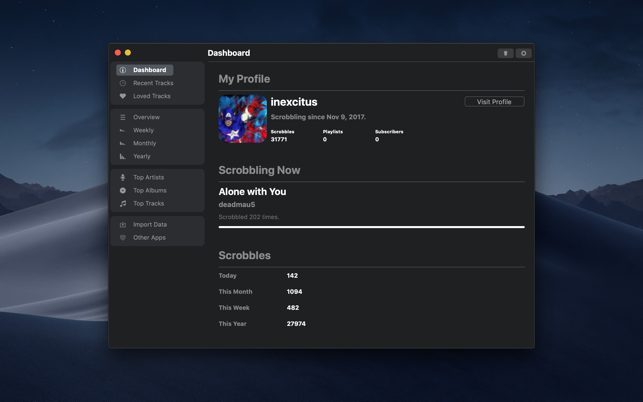 The overlay window always stays on top of other windows and shows the currently playing track and the number of weekly, monthly and yearly scrobbles! 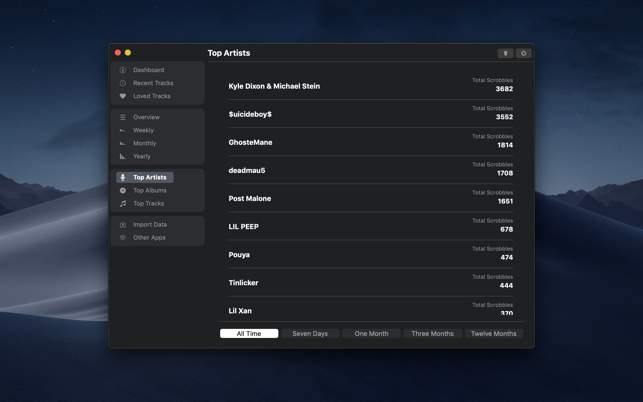 Select a time interval and see your favorite albums, artists and tracks! Once the app is started, all data since the last app start is imported automatically so the database is always up to date. 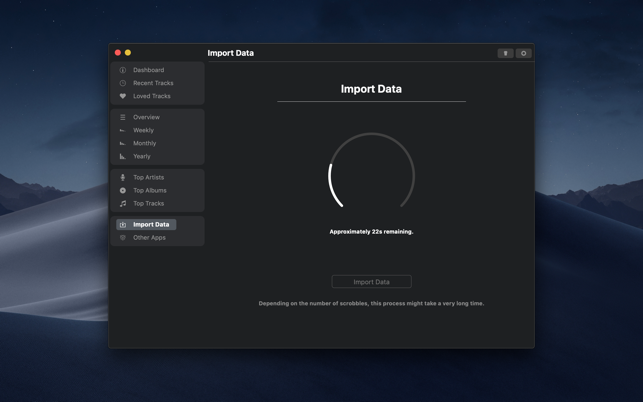 The data import can also be started manually. Every single track that is scrobbled is stored in a local database. This database is then used to create a personal listening report. You can see weekly, monthly and yearly listening reports. The app comes in a very lightweight and modern design. 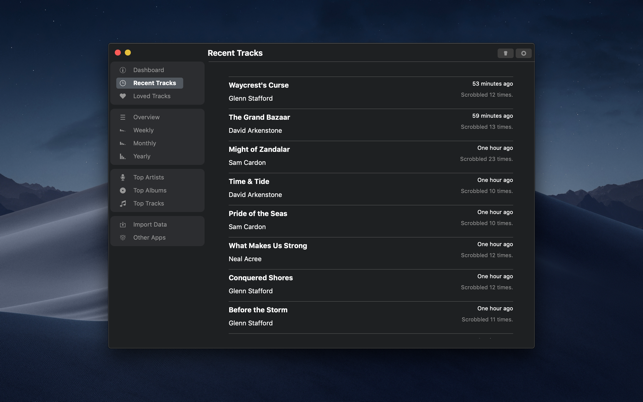 You can choose between a light and a dark theme. This app is powered by AudioScrobbler. The scrobbler not only does what it's supposed to, it even looks great! The features on this are also amazing. Defintely worth checking out! Would be great if it worked. Program will not start. Tried restart and still nothing. Its a shame because I am missing soooo many Scrobbles. I have the most up to dat version, still nothing. by now, I am pretty sure, that the app was running but you did not notice it. The app only starts as a menu bar widget, so I assume that the menu bar widget was temporarily blocked by another menu bar item. I have improved this behavior with 1.5.0, so maybe you want to give the app another chance. I downloaded from the App store and it does not open.